Hey friends! 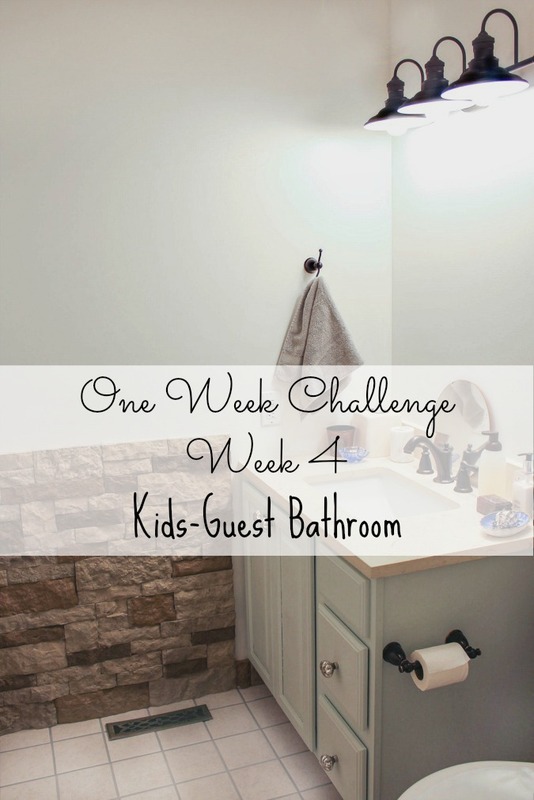 I can’t believe that it is already week four of the One Room Challenge! 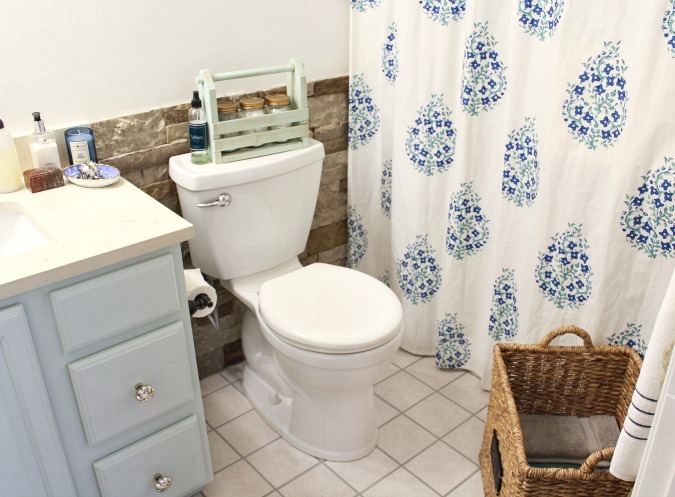 In case you missed it, I am participating in the One Room Challenge for the first time, and I am renovating our kids-guest bathroom. I have 6 weeks to complete the room, and it’s more than halfway there now. If you are new to my blog, welcome! I hope you will stay awhile and have a look around! If this is your first time catching an ORC post of mine, you can catch the first three weeks here, here, and here. If you aren’t familiar with the ORC, it is a widely anticipated two time per year event where 20 featured design bloggers transform a space and document it once per week for 6 weeks. 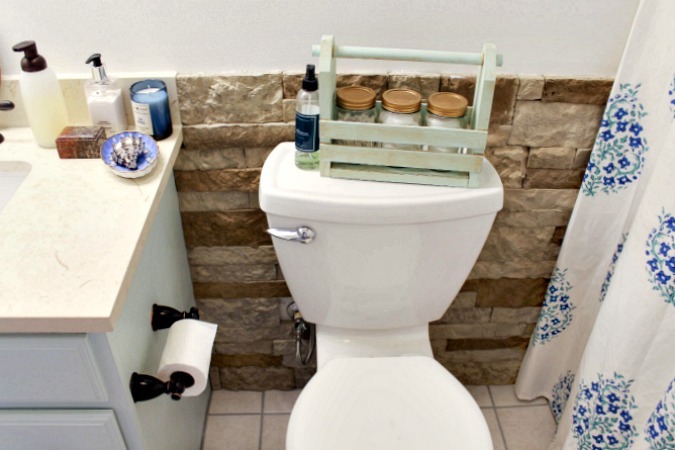 In addition, everyone with a blog is invited to join the shenanigans and be a guest participant by linking up their own room transformations each week. For this fourth week, we managed to get the room painted and the grout refreshed. I also managed to get a little better at taking pictures of this impossible to photograph room. How about we have a quick refresher of the progress of the room? I painted the walls and trim in the color Simply White by Benjamin Moore, the walls are a satin finish, and the trim is a semi gloss. The vanity was made over on week one. The AirStone was installed for week two. 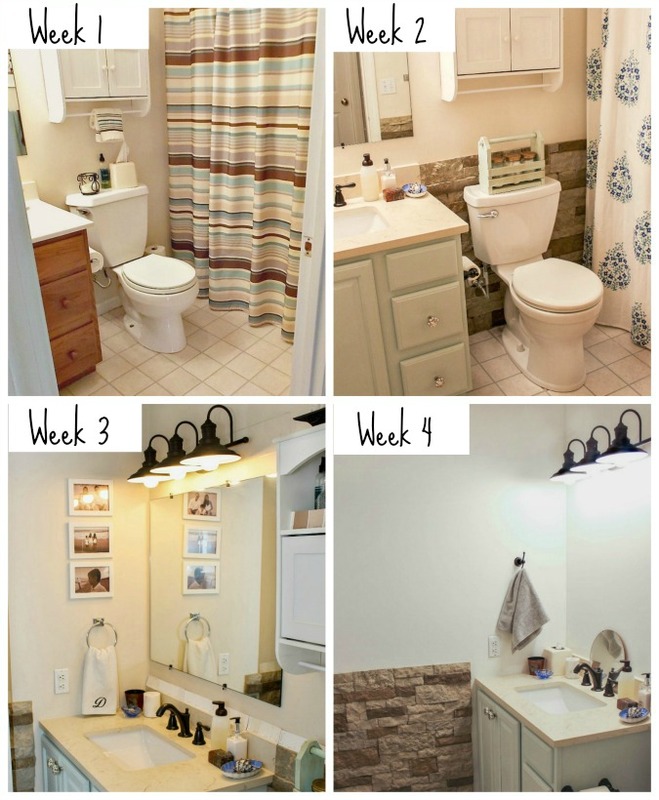 For week three we changed out the lighting, and week four we painted the walls and trim, Hung new towel holders, and refreshed the grout. I knew from the beginning that I was going to paint this room white. 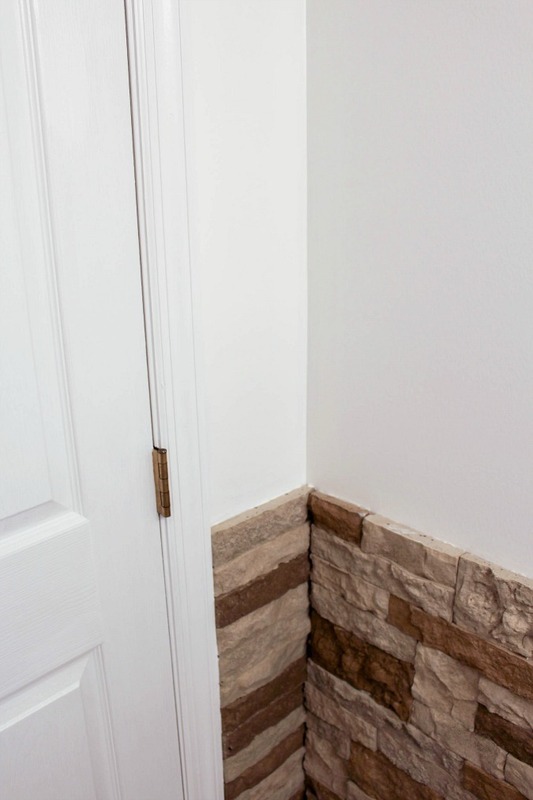 When we decided to hang the Airstone in here, I knew I needed something to balance the darkness of the stone and brighten the room. The room had been painted a cream, almost yellow color by the previous owners. I don’t think I realized how much the wall color gave everything in the room a yellow cast until I painted them white and took these photos. But what a difference this white color made in this room! No more yellow cast, and it really made the room so much brighter! 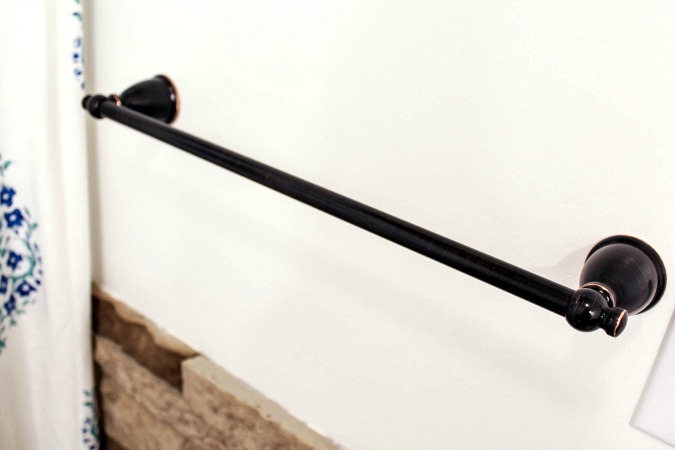 Before I painted the walls, I was considering dry brushing the AirStone with white paint, but after I saw the white up on the walls, I decided against it. 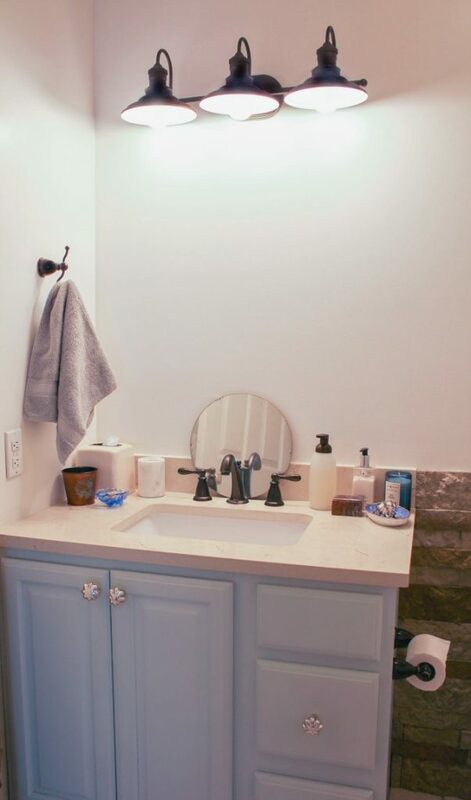 As you can see, we also removed the mirror over the sink. It will be replaced with a framed mirror that I painted a fun color. 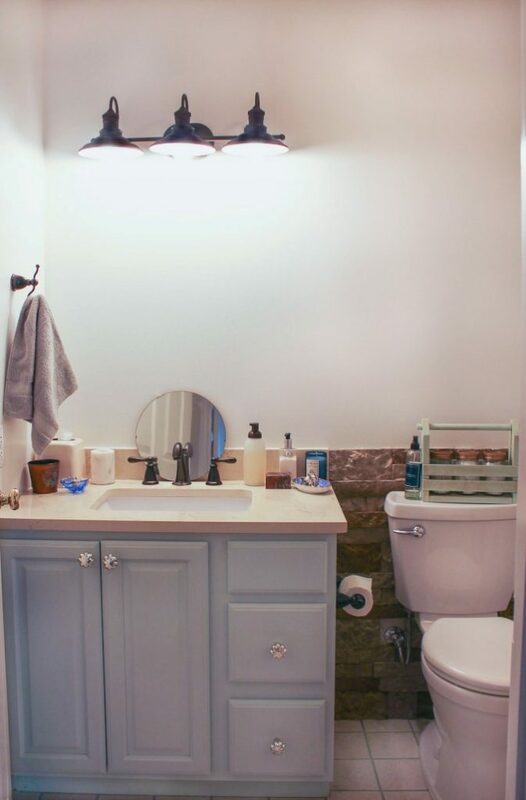 Have you noticed that we removed the tacky white cabinet that was hanging over the toilet? I have big plans for some funky and cool shelves that will be hung here. The next thing I need to do in this room is to trim out the AirStone at the top so you can’t see that unfinished edge. They do make finished edges, but I was using AirStone that I had left over from our fireplace project, I didn’t have the finished edges. I plan to add a thin ledge that will be painted the same semi-goss white as the rest of the trim. That will go a long way in giving this AirStone a finished look. 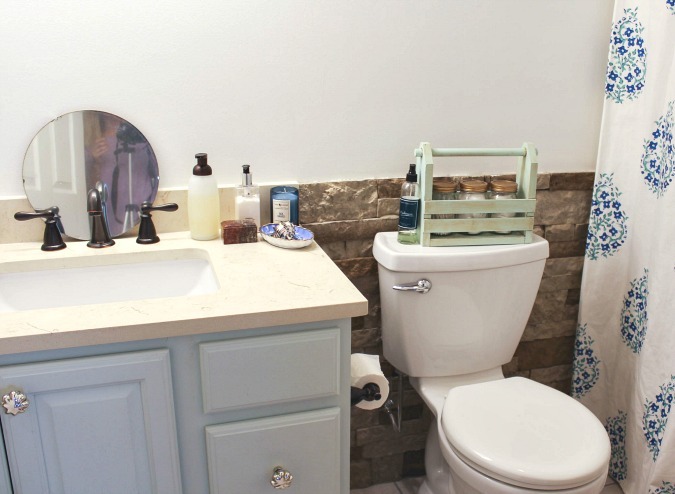 This vanity is painted bluegrass white by Glidden. 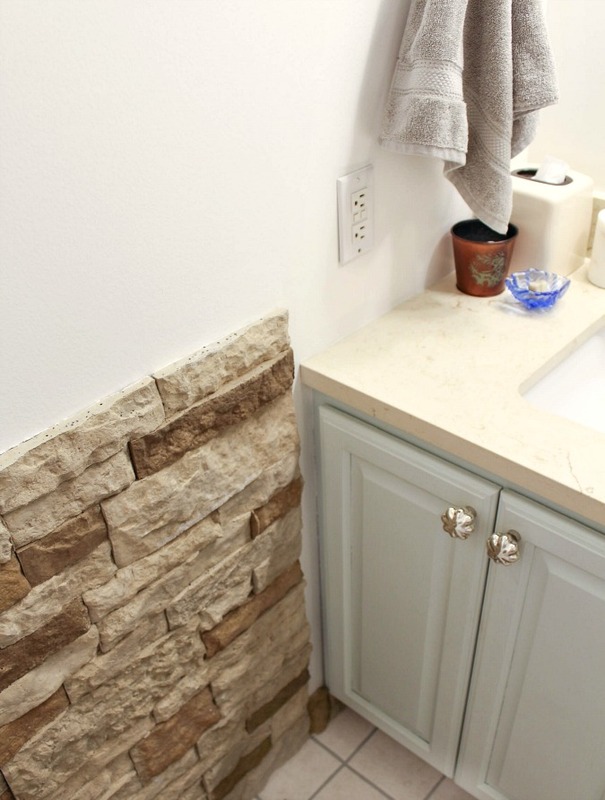 It is not in the plan to replace the cream colored ceramic tile in this room. 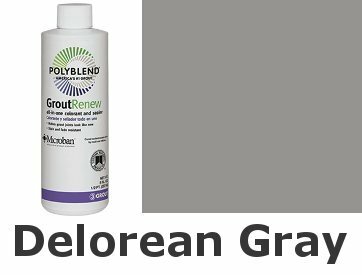 So I also refreshed the grout using Polyblend Grout Renew in Delorian Gray. I will also be adding a pretty new rug in here. This tile isn’t awful, but I wouldn’t mind changing it out one day. Just not right now. I purchased this round mirror at an antique booth a couple of months ago, and I plan to hang it on one of the walls in here. There is a wooden edge behind that I think I may paint, and then I may find a creative way to hang it that gives the mirror a little more character. 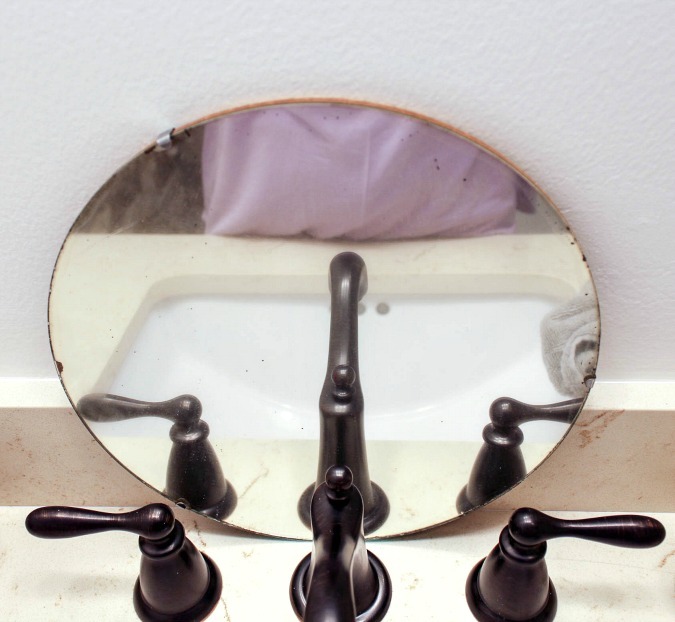 But I do love the patina of the vintage mirror, don’t you? I chose this hook to use for hand towels. 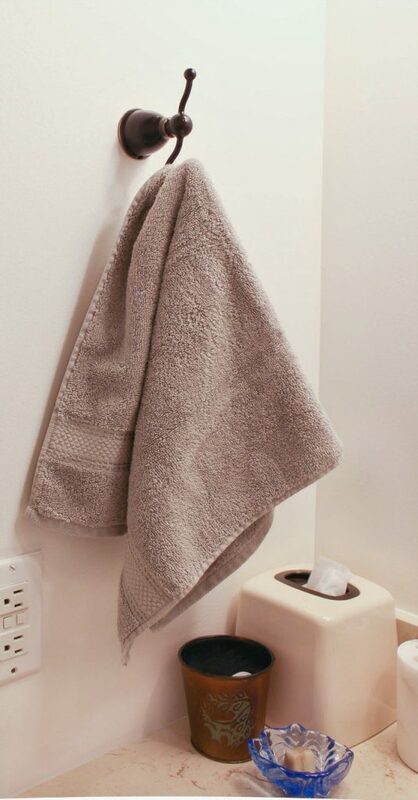 Generally a hook like this is used for a robe or bath towels, but I liked it it here because my daughter uses a washcloth for her face, and it is always laying on the sink, so I thought this was a good solution and gives her a place to hang her washcloth. We also hung a new towel rack that matches the other new fixtures in the room. I really love the bath towels I bought. 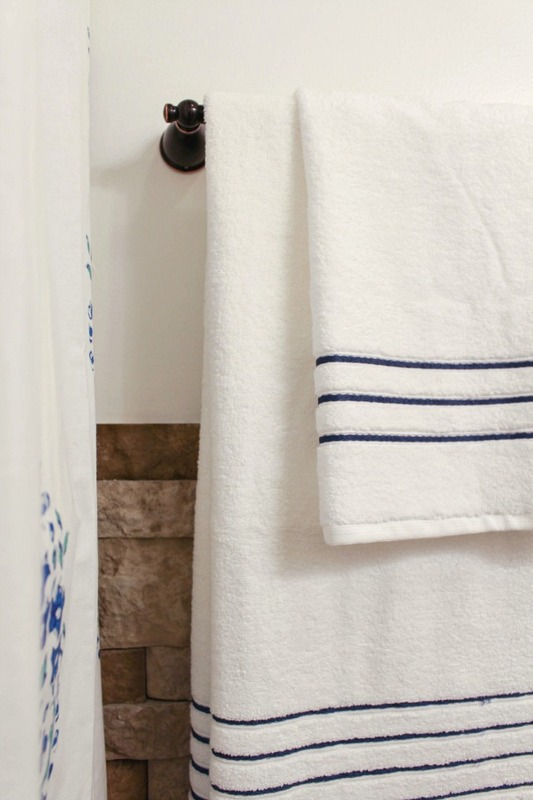 They have a simple blue stripe that I think is perfect with the shower curtain. 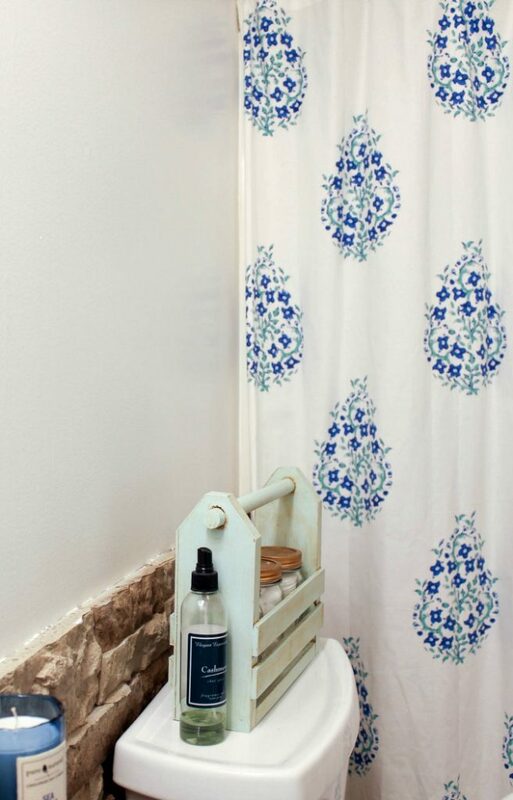 They bring out the blue in the shower curtain, but the pattern doesn’t compete. I’m sweating in my boots about whether I am going to finish this room on time because we have a lot going on right now. Mr. 16 year old and his cross country team are running in the state championship on Saturday morning and we are leaving tomorrow morning to travel there, so that knocks out most of my weekend. Hopefully, I will get a lot done on Sunday! I still have to do the trim around the AirStone, and make a DIY shelf to hang, and then add decor and accessories and style and photograph the room. I have two weeks left until the big reveal, so wish me luck!